Shoe Doctor, PhD: Project Presentation: It's Shoesday! It's Tuesday Shoesday! Check out who else is celebrating with Shoeperwoman. It's also another project presentation day, this time my presentation is called, "Assessment of differential gene expression and GO term enrichment across developmental stages of C. elegans." It went pretty well. But, boy, am I glad I am done with finals! It's been quite a torturous last 3 weeks. Let's just say that if I averaged my hrs of sleep per week, I would still be in the single digits. Ouch. Today, in celebration of the sun coming out again (however briefly it will last this time) and it being 70 degrees outside, I decided to add some floral pop to my 'dress for success' outfit. 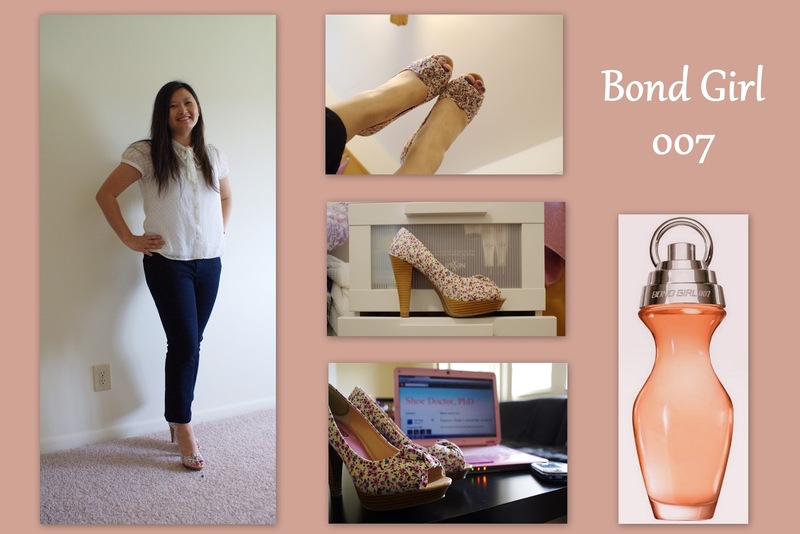 These are my floral Kenneth Cole Unlisted 'Bond Girl' pumps. So naturally, I also dabbed on some Avon Bond Girl 007 perfume (I love the smell!). I kept everything else pretty simple. These shoes are really cute but fit kinda funny. A bit tight around the toe box yet loose in the heel, so I wear them with quite a bit of padding (heel grips + ball of foot non-slip cushions). What are you favorite shoe fitting remedies? Cute! Those are perfect for Spring/Summer. I like your picture too, did you get that with a timer? Yep, I used a timer. Even so, I was still awkwardly bending down to autofocus the shot without moving my feet. Taking photos of yourself is hard! By the way, Mother in Heels, I just updated the post, so come back and check it out!